Zebra GK420t - Direct Thermal/Thermal Transfer printing, 203 dpi, 4" print width, USB and Ethernet Interfaces. Includes US power cord and USB cable. We use these throughout our organization and they perform flawlessly. Virtually no maintenance is ever needed. Just plug them in and let them go. Great product overall. Order takes awhile especially if being manufactured from scratch. 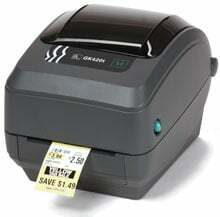 Zebra makes solid & reliable printers. Great little printer/label maker. It broke after 6 months, but not sure why. I was able to fix it myself, but not sure why one of the cogs fell off. Great printer though. Easy set up and fast to print. Hardly ever jams. I recommend this little beast. It took a lot of use before it momentarily broke. Effective for use as a spine label printer in a small research library. Fairly simple installation, and labels and ribbons are easily replaced.